"The problem is that you don’t just choose recovery. You have to keep choosing recovery, over and over and over again. You have to make that choice 5-6 times each day. You have to make that choice even when you really don’t want to. It’s not a single choice, and it’s not easy." 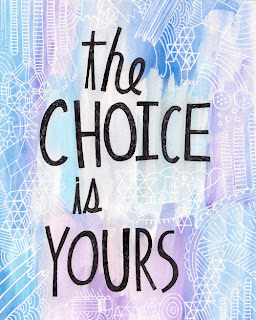 Two nights ago I read this post called "What it Means to Choose Recovery" written by Carrie Arnold on her blog "ED Bites," (which is the most brilliant eating disorder blog ever) and it got me thinking about my own recent choices in recovery. As much as I hate to admit this, over the past 3 weeks my weight has progressively decreased. Nothing serious, I'm still in my range, but enough to make me stop and reflect on what has changed. Today is the last day of my semester. YAY! However, with the stress of finals, an exciting guest speaking opportunity coming up, pressures to find a summer job, trying to figure out the ridiculously stupid student loan process, a few personal relationships coming to an end, and a lack of sleep, I feel a little shaken. 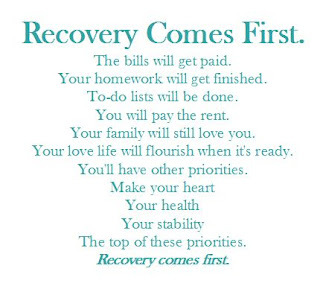 Oh and I almost forgot to mention recovery, the most important thing on my to-do list is always on my mind as well. I am quickly discovering there is a really tricky place in recovery where even though I want to live "normally," I also need to make sure I remember to constantly choose recovery. As Carrie Arnold said, recovery is a choice I need to make multiple times a day, and for me, I am learning, this is especially important when life gets busy. The scary thing is, however, life is only going to get busier as I continue to recover making my choices even more important. Recently choosing to focus on "life" has come before recovery. My meal planning has slipped a little and as the scale has shown, it's affecting my weight. I can't tell you how many times I have thought to myself, "Why can't I just be normal? Why can't I just eat and deal with stress like normal people?" It's frustrating. Sometimes I forget to remember that even though my life is slowly piecing itself back together, I am still in recovery. It's kind of scary how quickly those eating disordered thoughts creep up and how easy it is to miss a few calories here and there because I am "too busy" or "too stressed." Luckily, I have a choice. The choice of recovery. 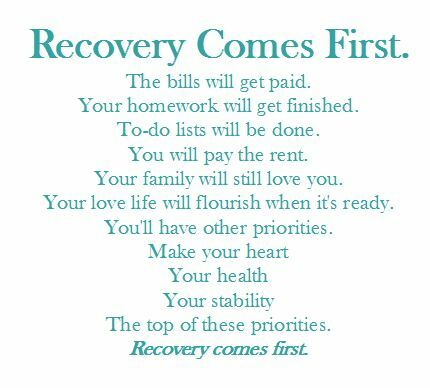 The bottom line is, choosing recovery - a million times a day if needed - comes first. Period. Life will always "throw me curve balls" as my dad would say, but unless I am taking care of myself none of that other stuff matters. In fact, id say its even more important to stay on top of it post weight gain, cos its not as visibly noticeable as it is when you are very underweight... which almost makes it more dangerous, mentally, if the thoughts and behaviours get a hold again. Thanks girl! You are so right about it being harder once you are weight restored. I never really thought of it that way. Thanks for point that out. It really does become easy to miss a few calories here and there, but it's just not worth it. Amen to this sister! You're just going to need to take a small break from all the stress and focus on yourself for a while. Things can wait. And now you're completely done with this semester, so you're going to have more free time. Make sure that YOU are your number one priority; you can't have others unless there is a healthy Kelsi. I'm still super proud of you, especially since you could recognize this and know that you need to focus on recovery first; that alone shows how incredibly far you've come in just a short year! 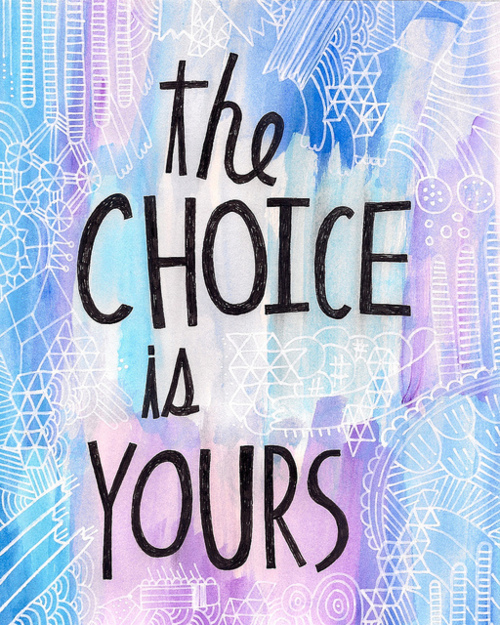 YES YES YES choosing recovery is a choice that only you can make and keep making. it is tough because life sometimes pushes you away from this priority but it has to be a priority for a while. you are strong and continually amaze me. You know where to find me if you ever need an ear!